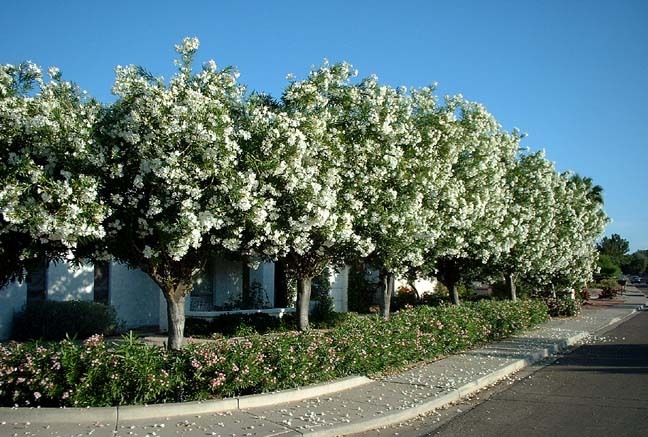 Landscape Use: Multiple uses dependent on vigor of cultivar indcluding foundation, accent, informal hedge, background, screen, street and parking lot tree standard. Form & Character: Oleander is a versatile evergreen shrub, stiff low, rounded and mounding to strongly upright and open, often imposing. Growth Habit: Plant vigor is cultivar dependent ranging from 4 to 20 feet in height. Foliage/texture: Green, lanceolate, whorled, sessile, entire leaves to 4 inches long w/ prominent light green mid vein, leaves taper to acuminate tip; medium texture. Flowers & fruits: Many flower colors ranging from white to pink, salmon to burgundy. Fruit are narrow, elongated capsules to 5 inches long. Seed is wind dispersed in fall and winter. Only occasionally reseeds in southwest urban landscapes. Seasonal color: Flowers profusely April to September, most brilliant displays range from May in desert areas and to July along the southern and central California coast. Temperature: Hardy to 15o to 20oF and absolutely thrives in hot summer desert areas. Flowers are heat tolerant in the following manner; white > pink > salmon > red > deep red. Light: Full sun (no shade). Soil: Tolerates all but the most highly alkaline soils. Watering: Surprisingly drought tolerant, but does do well with some supplemental water throughout the warmer times of the year. During winter, no supplemental water is needed. 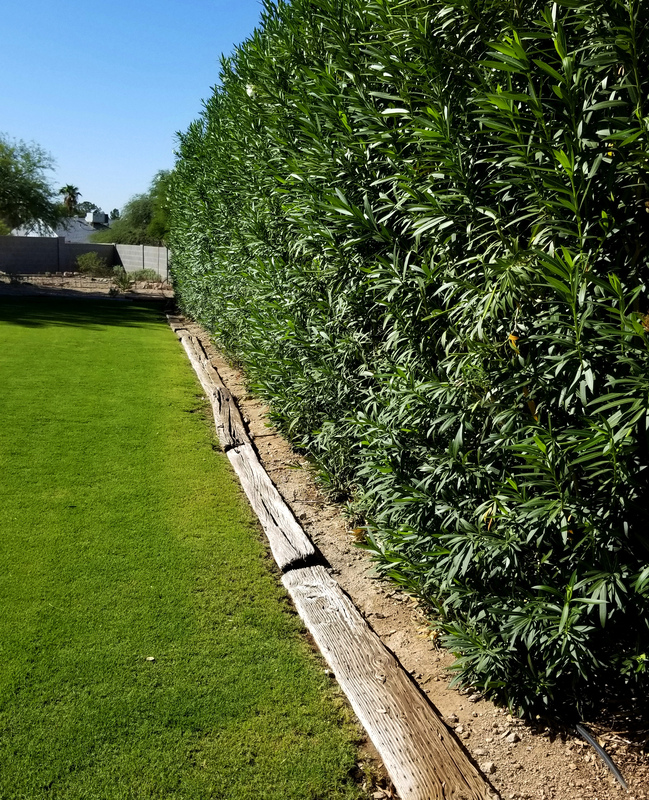 Pruning: There are two horticulturally savy once-a-year pruning strategies for oleander in Phoenix. For dwarf cultivars, prune in late February to early March to any height. For large cultivars, prune in August. Severe renewal pruning can be done once every two to three years. Sadly, many Phoenix oleanders are frequently abused...er, I mean sheared. When sheared repeatedly, foliar disease transmission is heightened, water use efficiency is decreased. Over time, regularly sheared oleanders perform poorly and might die. Disease and pests: Oleander gall, oleander green and yellow aphid in spring, soft scale, and oleander leaf scorch caused by the oleander strain of Xylella fastidiosa, a bacteria that colonizes xylem tissue and is vectored by xylem feeding sharpshooter insects such as the smoke tree sharpshooter. 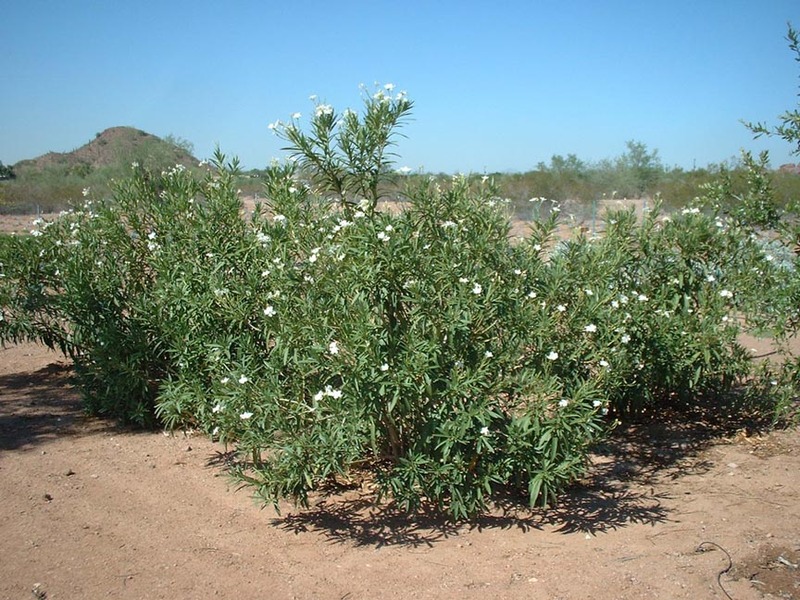 Oleander leaf scorch is a lethal disease that is a big problem in southern California that is now present on oleander in the lower deserts of Arizona. There is NO effective control. Current import of California oleander nursery stock is quarantined. Additional comments: The operative word phrase for oleander is "deadly poisonous"! In AD 77, Pliny the Elder described oleander as "an evergreen, bearing a strong resemblance to the rose tree, and throwing out numerous branches from the stem; to beast of burden, goats, and sheep it is poisonous, but for man it is an antidote against the venom of serpents". How wrong he was! All plant parts are poisonous. One leaf, if ingested, may be lethal enough to kill a 150 lb adult. Children should be cautioned to NOT eat or touch foliage. 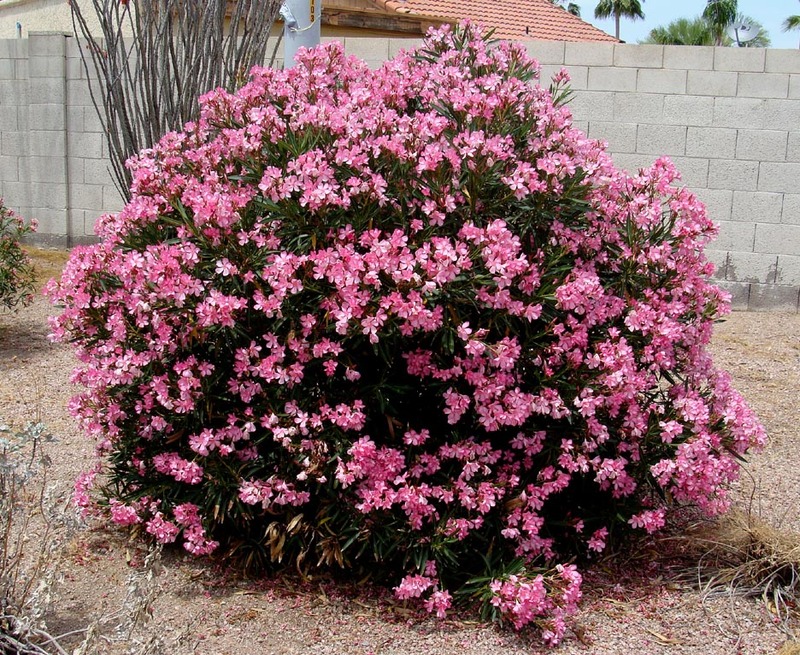 In 2000, two toddlers in California were found dead in their cribs after chewing on oleander leaves. Smoke from burning oleander debris can be fatally toxic if inhaled. Always wear gloves and wash exposed body parts (hands, face, etc.) after pruning or handling this plant. The complete toxicology is only recently known. 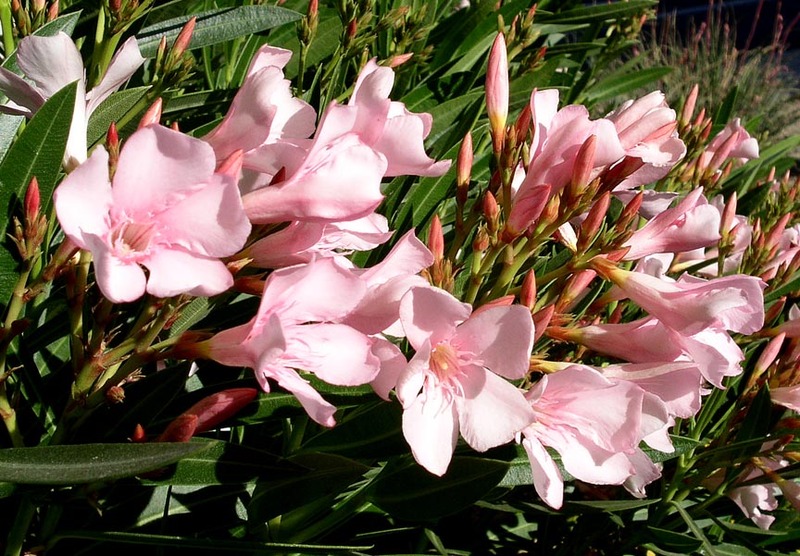 Oleanders bloom over a long period of time from spring through summer and are a highly versatile landscape plant. Oleander's resurgence in popularity may be credited to the present abundance of dwarf cultivars. Oleander is also often used as a tree standard despite profuse basal suckering (remember it is a shrub).